Brendan Granahan, the new sales manager at Keenan Bauer, will be familiar to many people in Mullingar and Westmeath, thanks to his experience in the motor trade, and his involvement in sport. Brendan has18 years experience selling cars at Westmeath Motors, as well as three years managing the Costcutter outlet and the Topaz filling station . 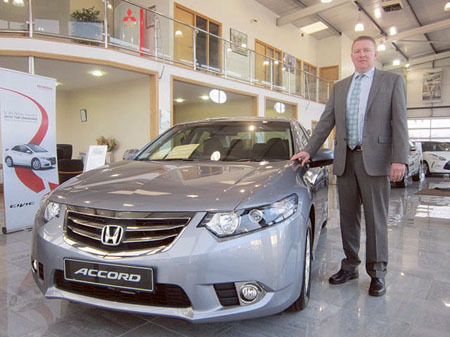 Brendan is now dealing with Honda, Mitsubishi, and Citroën for Keenan Bauer at Lough Sheever Corporate Park in Mullingar. He is looking forward to meeting new and old customers alike and discussing the latest models from Honda, Citroën, and Mitsubishi with them. Pat Keenan at Keenan Bauer said the team there are delighted to have Brendan on board, and are looking forward to working with him. An award-winning dealership, Keenan Bauer has an extensive selection of models from Honda, Citroën, and Mitsubishi and a range of top quality, low-mileage used vehicles. There are regular offers and attractions at the showroom, from free fuel to valuable warranties, so it’s always worthwhile calling in to see what’s on offer. For more information log on to honda.keenanbauer.com, call Keenan Bauer at Lough Sheever Corporate Park, Mullingar on (044 ) 934 2400, or email [email protected].